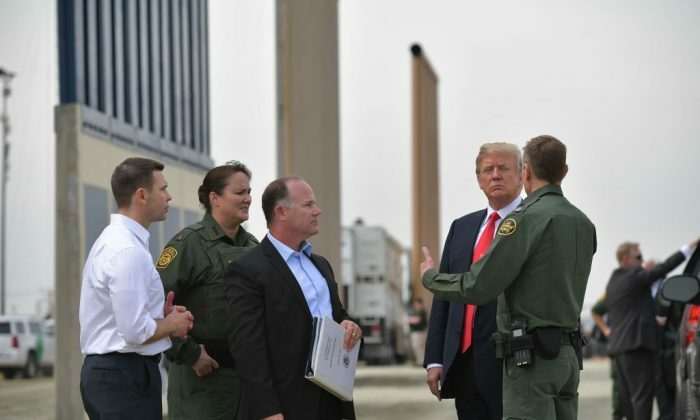 President Donald Trump proposed on March 25 to use the recently approved giant military budget to fund the wall on the border with Mexico, emphasizing the barrier’s function for national defense. Trump’s proposal comes at a time of increased tensions with Iran. Hezbollah, the Iranian regime’s terror proxy, has built up an ominous presence in South America, especially in Peru. The threat of armed terrorists crossing the border is likely to increase if the president delivers on a campaign promise to withdraw from the Iran nuclear deal. Trump is scheduled to visit Peru next month, his first visit to South America as president. Trump signed a $1.3 trillion spending bill on March 23 that included $654 billion in funding for defense but only $1.6 billion in funds for work on the border wall, his signature campaign promise. The importance of funding the wall was made clear when Trump briefly threatened to veto the spending bill because it didn’t include adequate funding. The $1.6 billion is far short of the estimated $25 billion needed for the wall, and the funds come with strings attached, prohibiting Trump from building the kind of wall he wants. Before casting the wall as a military structure, Trump promoted it as a way of stemming the flow of illegal drugs and aliens across the border. Opioids killed 42,000 people in the United States in 2016, a five-fold increase from 1999. Meanwhile, illegal alien households drain an estimated $55 billion from American taxpayers every year, according to a study by The Heritage Foundation. I want to address the situation on border security, which I call national defense. I call it stopping drugs from pouring across our border. And I call it illegal immigration. It’s all of those things. Before signing the spending bill, the president attempted to cut a deal with Democrats, offering concessions for beneficiaries of the Deferred Action for Childhood Arrivals program in exchange for $25 billion for the wall. The White House rejected the deal after the Democrats asked for far more. Trump had hinted at the signing ceremony that the military could be used to build the wall. The president brought up Gen. James Mattis to speak immediately after he remarked on the wall’s military significance. In Mattis’s brief comments, he mentioned that the Pentagon will use the money granted in the spending bill wisely. “In 1790, in George Washington’s first annual address to Congress, he stated, ‘To be prepared for war is one of the most effective means of preserving the peace,’” Mattis said. The military could fund the wall by generating 3.8 percent in cost savings. The armed forces are also well staffed and equipped to carry out the work. The Army Corps of Engineers employs more than 37,000 members skilled in building critical infrastructure. The Navy Seabees have 7,000 personnel on the construction force, with 6,297 in reserves. The Army Corps of Engineers had already done preliminary work for wall construction by July last year. Engineers drilled and took samples in California, New Mexico, and Texas to determine which type of wall would be needed in different areas along the border. A change in how the military spends its budget would require 60 votes in the Senate, and Trump would need to swing Democrats to do so. Former President Barack Obama circumvented Congressional approval for a spending bill in 2009 by issuing a signing statement, a practice presidents have used since the 19th century. Former President George W. Bush signed more than 140 such statements. Obama signed dozens.